Isaac Bashevis Singer once wrote. "He who sees, sees slow." While the Nobel Prize winner was thinking along philosophic lines, suggesting that to better understand ourselves and our world we must not hurry into judgment, Gideon Ariel surely agrees, and as a man of science, literally proves Singer's thought. Ariel's work is the study of physical motion-how the body functions when walking, running, jumping, throwing, kicking, hitting-and finding ways, through the use of high-speed photography and computer technology, to improve man's performance. His main concentration, not surprisingly, is on sports. That may seem frivolous compared to the search for inner peace or a cure for the common cold, except that most of us do take our game-playing rather seriously. Furthermore, it can be argued that Ariel's "vision" touches on deeper concerns than simply the improvement of athletic pursuit; while extending our visual perceptions of the physical world he also challenges some commonly held beliefs about how the human body functions. Ariel takes a breather front an exercise machine hooked up to a computer analyzer. 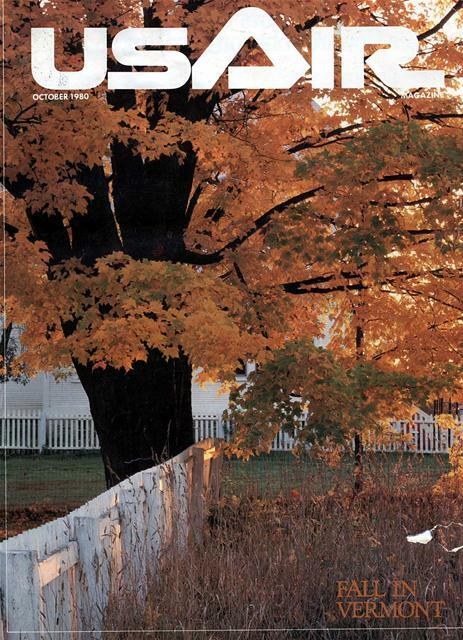 Before the 1976 Olvmpies, discus thrower Mac Wilkins' best toss had been 219 feet 1 inch. But by applying Ariel's advice, he threw the discus over 232 feet to win the gold in Montreal. smaller men usually hit slap shots, their sticks hitting the ice first, then the puck. "However, the harder, faster shot," Ariel explains, "is when the stick hits down on the ice first, because it bends and becomes loaded with energy that is transferred to the puck." Hockey coaches-used to searching for and training big men-were skeptical until Ariel demonstrated, and proved, his point. Afterwards they had to agree, but only grudgingly, and so far there is no evidence of their insisting on the slapshot when a player has a choice. Ariel doesn't understand why most coaches won't incorporate his findings. "I don't say I have the final answer," he says of his hiomechanical research, "hut that there is a tool available that has been proven effective." his system, take one of Ariel's most celebrated successes. mum exertion at any instant during Wilkins' motion. The numbers also supplied Ariel with information about the magnitude of muscle action at each joint, vertical and horizontal forces at the ground contact points, the timing of an action. and the coordination between body segments. Finally, the computer electronically produced a stick-figure diagram of Wilkins on a small television screen. With this schematic, Ariel could analyze individual aspects of Wilkins' form to determine what changes in his body angles. timing, velocities, and weight distribution would improve his performance. Ariel's print-out sheets and stick-figure athletes were beyond the comprehension of Wilkins. as they would be to anyone without experience in the rarefied world of computers. But moved by Ariel's enthusiasm and athletic background, Wilkins decided to hear what the man had to say. Ariel told him he was not making efficient use of his legs, specifically that his front (left) leg was continuing to turn as he moved into release position as well as coming off the ground too soon; by continuing to move, the leg was absorbing energy that could be transferred to the toss. So Wilkins changed his technique. He learned to plant his front leg more firmly on the ground and keep it there longer. thereby setting up a solid base of support that would produce greater momentum in the upper body. He also altered the angle of his arm at release from 70 to 30 degrees by throwing his lead hip forward sooner and keeping the discus "hanging back" so he wouldn't release it too early. Was it worth it? Until the '76 Olympics, Wilkins' best toss had been 219 feet 1 inch against a world record of 226 feet 8 inches. After incorporating Ariel's suggestions into his technique, Wilkins threw the discus 232 feet 6 inches to set a new world record and win the gold medal in Montreal in 1976. He gave Ariel more than a little credit for his achievement. To analyze the body's efficiency. 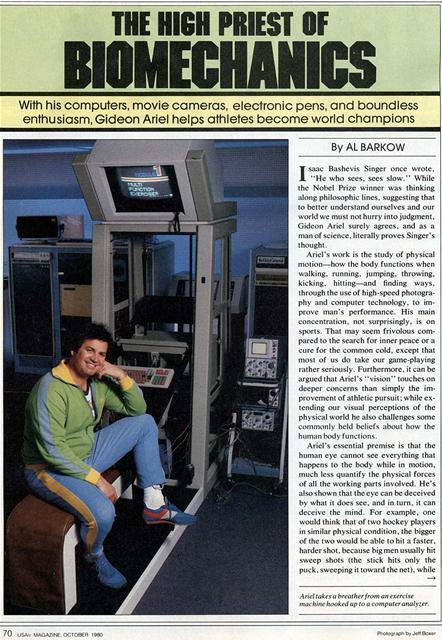 Ariel runs a film of the athlete through a computer, freezing each frame and measuring critical angles and lengths with a magnetic pen (left). The computerthen creates a schematic printout (right)-in this case, of Jitnnv Connors as he serves. that pushes the body further forward. Women basketball players began jumping two inches higher after Ariel convinced them not to bend their knees as deeply as they had been. 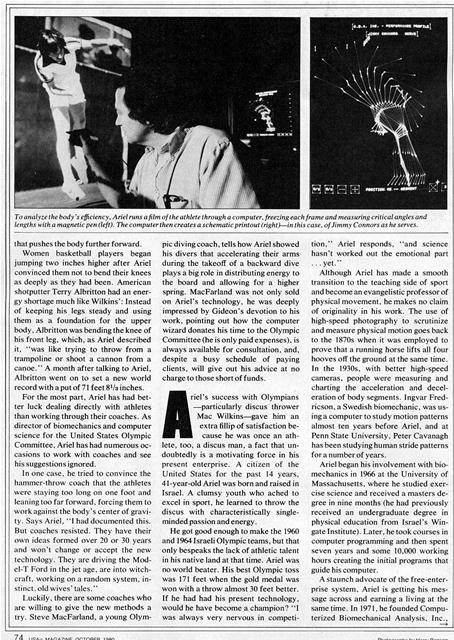 American shotputter Terry Albritton had an energy shortage much like Wilkins': Instead of keeping his legs steady and using them as a foundation for the upper body, Albritton was bending the knee of his front leg, which, as Ariel described it, "was like trying to throw from a trampoline or shoot a cannon from a canoe." A month after talking to Ariel, Albritton went on to set a new world record with a put of 71 feet 81/3 inches. For the most part, Ariel has had better luck dealing directly with athletes than working through their coaches. As director of biomechanics and computer science for the United States Olympic Committee, Ariel has had numerous occasions to work with coaches and see his suggestions ignored. In one case, he tried to convince the hammer-throw coach that the athletes were staying too long on one foot and leaning too far forward. forcing them to work against the body's center of gravity. Says Ariel, "I had documented this. But coaches resisted. They have their own ideas formed over 20 or 30 years and won't change or accept the new technology. They are driving the Model-T Ford in the jet age, are into witchcraft. working on a random system. instinct. old wives' tales." pic diving coach, tells how Ariel showed his divers that accelerating their arms during the takeoff of a backward dive plays a big role in distributing energy to the board and allowing for a higher spring. 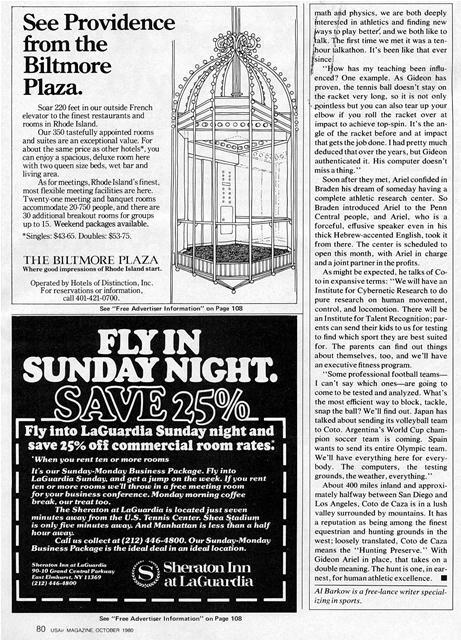 MacFarland was not only sold on Ariel's technology, he was deeply impressed by Gideon's devotion to his work, pointing out how the computer wizard donates his time to the Olympic Committee (he is only paid expenses), is always available for consultation, and, despite a busy schedule of paying clients, will give out his advice at no charge to those short of funds. cause he was once an athlete, too, a discus man, a fact that undoubtedly is a motivating force in his present enterprise. A citizen of the United States for the past 14 years, 41-year-old Ariel was born and raised in Israel. A clumsy youth who ached to excel in sport, he learned to throw the discus with characteristically singleminded passion and energy. Although Ariel has made a smooth transition to the teaching side of sport and become an evangelistic professor of physical movement, he makes no claim of originality in his work. The use of high-speed photography to scrutinize and measure physical motion goes back to the 1870s when it was employed to prove that a running horse lifts all four hooves off the ground at the same time. In the 1930s, with better high-speed cameras, people were measuring and charting the acceleration and deceleration of body segments. Ingvar Fredricson, a Swedish biomechanic, was usinga computer to study motion patterns almost ten years before Ariel. and at Penn State University, Peter Cavanagh has been studying human stride patterns for a number of years. Ariel began his involvement with biomechanics in 1966 at the University of Massachusetts, where he studied exercise science and received a masters degree in nine months (he had previously received an undergraduate degree in physical education from Israel's Wingate Institute). Later, he took courses in computer programming and then spent seven years and some 10.000 working hours creating the initial programs that guide his computer. At the new Coto de Caza Sports Research Center in California. Ariel rigs tennis coach Vic Braden with a bask that monitors movements of the eves as they try to .stav focused on the ball. in Amherst, Massachusetts, and through it sells his unique services. At first, his clients were almost exclusively manufacturers of athletic equipment. but as his reputation has grown, many professional athletes have sought his expertise. For example, pitchers on the Kansas City Royals baseball team came tinder Ariel's scrutiny and were told that it was "useless" to build up their wrist strength for throwing a faster ball, because, as Ariel showed them, the wrist simply goes along for the ride. The concentration of force from the legs, back, and shoulder creates the power thrust. the forearm is like the end of a snapped towel, and the wrist snaps far faster than any muscle can contract. covered about athletic technique had been guessed at previously by athletes. In his analysis of the golf swing, for example, Ariel compared slow-motion film of Jack Nicklaus and former President Gerald Ford-one a pro, the other an "average golfer"-and concluded that by rotating the hips rather than sliding them sideways, the golf shot can be hit with more power and greater control. Most serious golfers have recognized this truth, but usually only after considerable and sometimes painful experimentation. With the help of his CBA staff, led by his computer-specialist partner Ann Penny, Ariel has analyzed how tennis balls behave when struck with a racket. Among his findings was the fact that the ball is on the strings for only four milliseconds. Since human reaction time, according to Gideon, is on average 100 milliseconds, the ball is long gone before one feels the impact from hitting it. Thus, tennis players don't have nearly the control over a ball they've hit that they'd like to think. "In fact." says Ariel. "they have none." All the more reason to anticipate play and get the racket back early. Because sports performance depends so much on a firm, stable footing, it should come as no surprise that Ariel has a special interest in athletic shoes. He has even designed one that is inflatable; put it on. pump in the air, and the shoe conforms to the contours of an individual foot. He also owns numerous patents, 15 alone on an exercise machine to be distributed by Wilson Sporting Goods. Instead of weights. Ariel's system uses hydraulics to build up the muscles, and a computer to monitor and give instant feedback on performance. "In less time," he explains. "an athlete, and especially weekend players, can increase physical capacity without overextending the muscles." CBA is making some non-sport studies as well. Kimberly-Clark. the paper company, has asked for help in building a better carton for packing heavy refrigerators for delivery. An insurance company seeking a more honest count on disability claims has come to Ariel because he says that he can tell when a person is lying about a low-back injury. Obviously, business has never been better. But no man to stand still for very long, Ariel is now involved in a venture that would seem to be the pot of gold at the end of his rainbow. As part of a new resort and convention complex in southern California. he will have his most complete research facility for studying athletic movement. The twostory Coto de Caza Sports Research Center will be fitted out with the best equipment money can buy. Along with all the computers and cameras that a biomechanic could want, there will be a 200-meter running track inlaid with $25,000 worth of sensor plates to measure a runner's foot-fall pressure and the deterrent forces that cause injuries. There also will be the use of an extensive track-and-field setup-including discus and shot-put rings, pole-vault and high-jump pits-a golf course, and the more than 40 tennis courts of the Vic Braden Tennis College. next door and also part of the resort. In fact, it was Vic Braden who opened this door for Ariel. 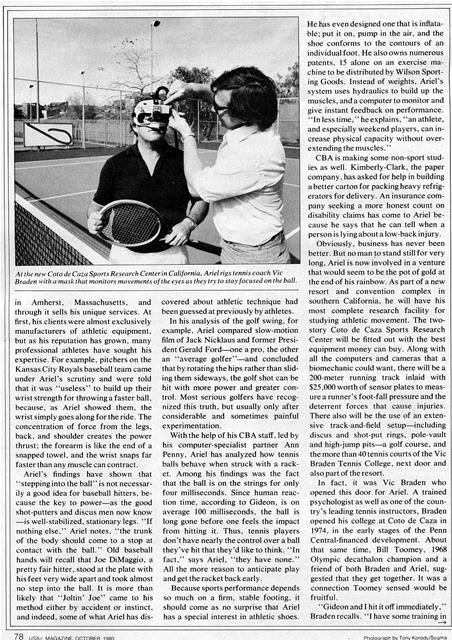 A trained psychologist as well as one of the country's leading tennis instructors, Braden opened his college at Coto de Caza in 1974, in the early stages of the Penn Central-financed development. About that same time. Bill Toomey, 1968 Olympic decathalon champion and a friend of both Braden and Ariel, suggested that they get together. It was a connection Toomey sensed would be fruitful. "I,tow has my teaching been influenced? One example. As Gideon has proven, the tennis ball doesn't stay on the racket very long, so it is not only pointless but you can also tear up your elbow if you roll the racket over at impact to achieve top-spin. It's the angle of the racket before and at impact that gets the job done. I had pretty much deduced that over the years, but Gideon authenticated it. His computer doesn't miss a thing." Soon after they met, Ariel confided in Braden his dream of someday having a complete athletic research center. So Braden introduced Ariel to the Penn Central people, and Ariel, who is a forceful, effusive speaker even in his thick Hebrew-accented English, took it from there. The center is scheduled to open this month, with Ariel in charge and a joint partner in the profits. As might be expected, he talks of Coto in expansive terms: "We will have an Institute for Cybernetic Research to do pure research on human movement, control, and locomotion. There will be an Institute for Talent Recognition; parents can send their kids to us for testing to find which sport they are best suited for. The parents can find out things about themselves, too, and we'll have an executive fitness program. "Some professional football teamsI can't say which ones-are going to come to be tested and analyzed. What's the most efficient way to block, tackle, snap the ball? We'll find out. Japan has talked about sending its volleyball team to Coto. Argentina's World Cup champion soccer team is coming. Spain wants to send its entire Olympic team. We'll have everything here for everybody. The computers, the testing grounds, the weather, everything." A! Barkoti, is a free-lance writer specializing in sports. Generated on 4/20/2019 3:12:10 PM (PST) ADI/HQ/GBA/2019/ARIELCLOUD/v3.0.2018.0126.